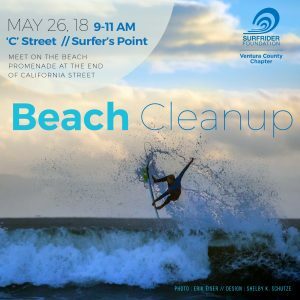 Thats right, we have another Beach Cleanup opportunity scheduled for May 26, 2018 from 9am-11am at C Street/Surfer’s Point. We encourage you to invite friends, family, and coworkers! If you have not done so already, please fill out a liability waiver found here before you arrive to the Beach Cleanup. We would like to extend the opportunity for you to sponsor a monthly Beach Cleanup in Ventura! Help protect our oceans, waves and beaches by sponsoring one of our monthly cleanups! Sponsoring a cleanup helps establish your company as a good corporate citizen and fosters brand loyalty. Cleanups can also be used to encourage employee engagement in their community, as well as strengthen employee team building and morale. Additionally, involvement in Surfrider corporate beach cleanups will enhance the image of your company as a positive contributor to the community and local environment. Your company’s tax-deductible donation to Surfrider goes directly to supporting our work to make sure our oceans, waves and beaches are healthy, protected and preserved for generations to come. ● Includes gloves, bags, and waivers. ● Includes a link to your business on our beach cleanup page of our website. ● Surfrider organizers will meet your group at the cleanup site to provide supplies, collect waivers, and dispose of trash afterwards. ● Includes a recognition announcement on our social media pages highlighting how much trash was collected and a link to your website. ● Your company logo will appear on promotional materials for sponsoring any existing event. Post-event wrap up includes: data summary and photos. All beach cleanup supplies included: permits, buckets, bags, grabbers, gloves, data cards, hand sanitizer, sunscreen.